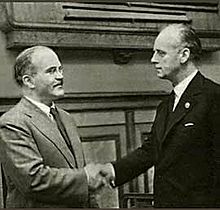 Molotov (left) and Von Ribbentrop (right) shaking hands after signing the treaty. The Molotov-Ribbentrop Pact (otherwise known as the Nazi-Soviet Pact) was signed by Vyacheslav Molotov (Soviet foreign minister working for Stalin) and Joachim von Ribbentrop (Nazi-German foreign minister working for Hitler) on 23 August 1939. The pact promised that neither the Soviet Union nor Nazi Germany would attack the other. It also divided Poland between them. However, after the pact (treaty) was signed, Hitler broke it in June 1941 by invading the Soviet Union (Operation Barbarossa). This was part of a series of conflicts in World War II. This page was last changed on 15 August 2018, at 06:15.